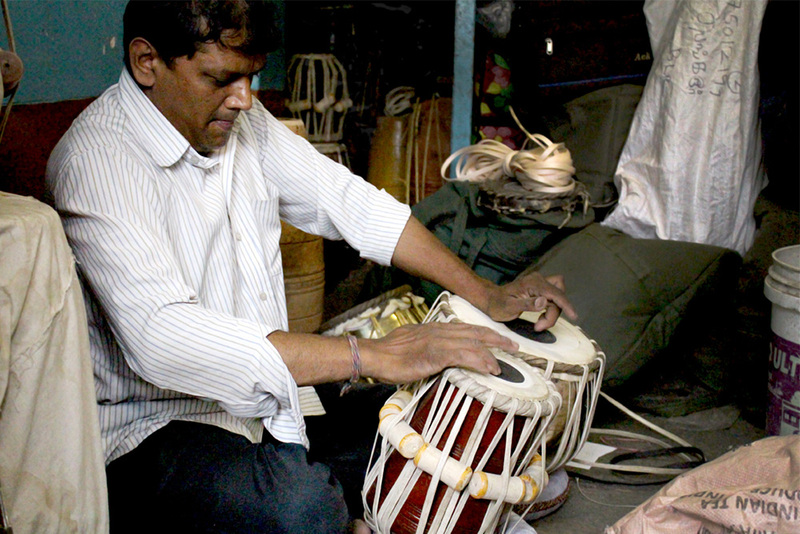 A set of drums that are tonally rich and harmonically complex are used in variety of musical genres ranging from devotional music to folk, filmy and fusion. 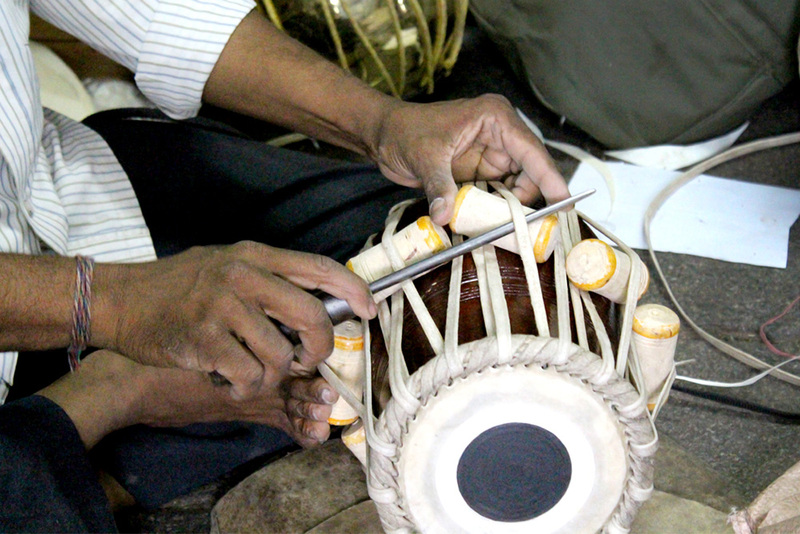 Perhaps they play the most eminent role in accompanying the Hindustani and classical music and also play as a solo instrument in Hindustani classical form. These drums are designed and developed in a unique way. The making of the two drums, namely dayan and bayan are very interesting. 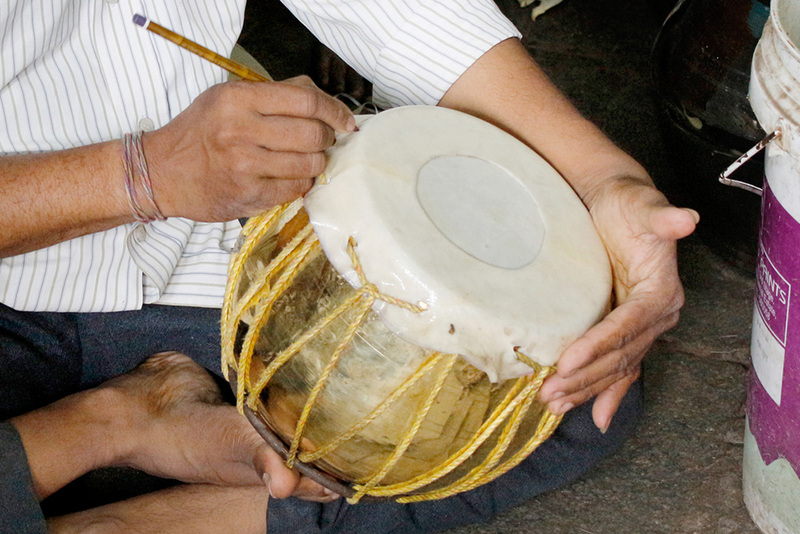 The word tabla is commonly used for a pair of drums but which is not appropriate when checked with the strict definition because the smaller drum on the right side is the tabla and it is also called as dayan whereas the larger left hand drum is called dagga or bayan respectively. 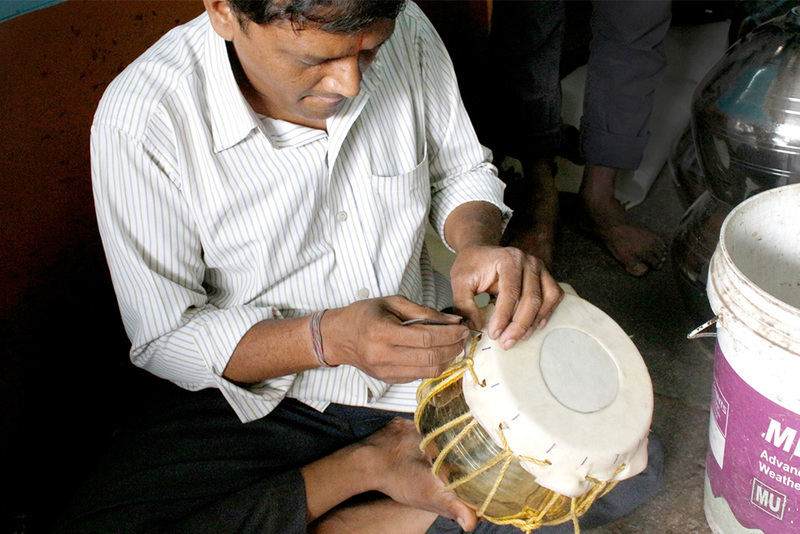 Making of these drums get initiated by constructing the primarily complex part of making the drumhead, known as ‘pudi’ plays a vital role. 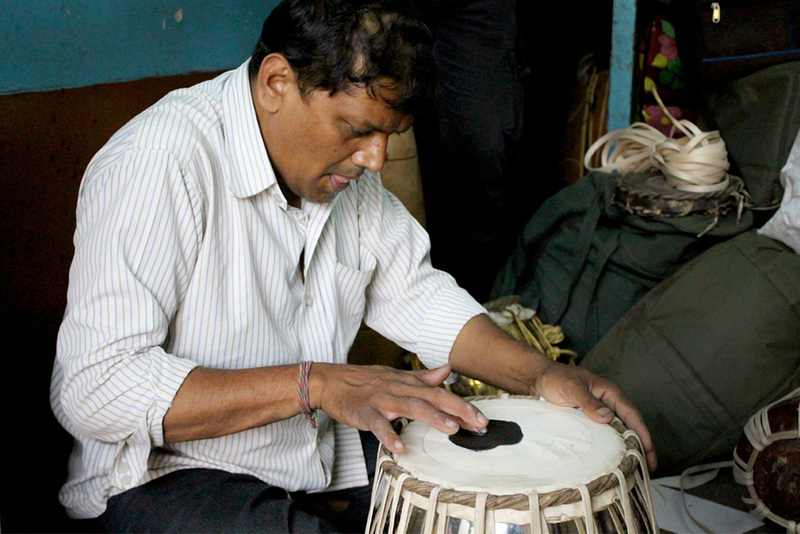 And the making of pudi is same for both the drums in Tabla. 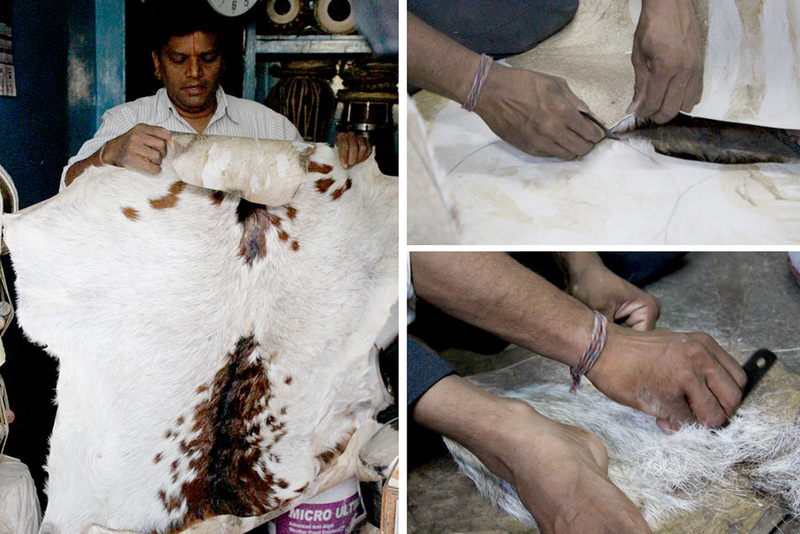 To prepare pudi, the right piece of goatskin is selected. Here the thickness of the goatskin is very important. The shoulder part of goatskin is usually used, as it is soft and uniform in thickness. This skin is further cleaned and de-hired. It is further soaked in water with the tinge of limestone powder, over a night. Later it is dried, marked and cut as per the requirement in a circular manner for various sized drums. 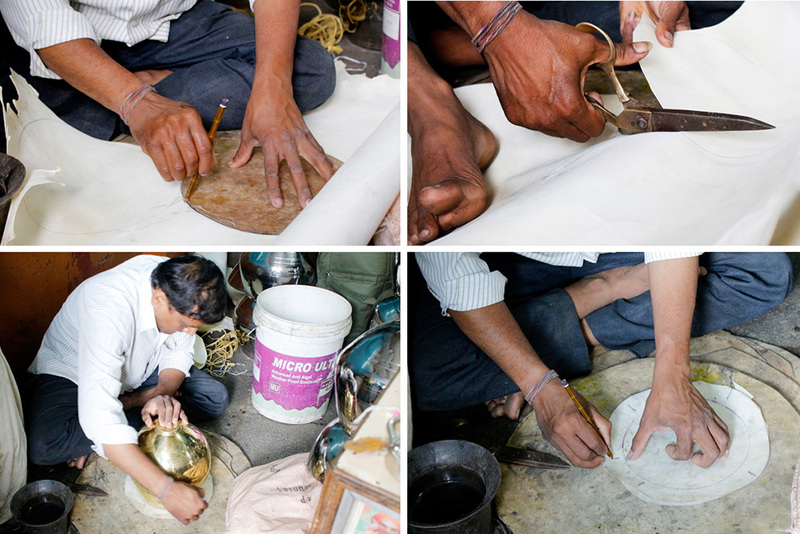 In this process of cutting the goatskin, when the drum’s mouth measures of about 7 ½ inches then the skin for covering its mouth is cut about 9 ½ inches. The skin is usually cut two inches extra than the precise measurement of the opening, to meet the requirement in a better-ordered manner. Here the best quality skin is separated and used as the main material. 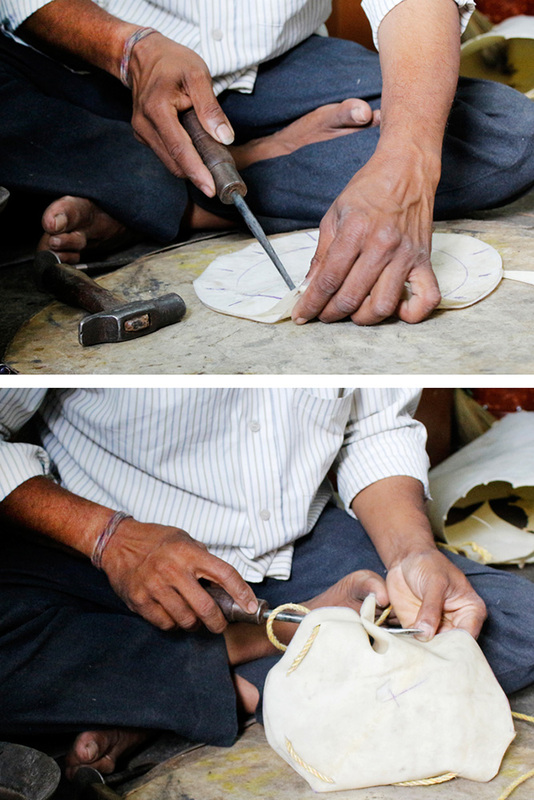 The remaining skin is used as the backing material and also used for making the outer covering of pudi. 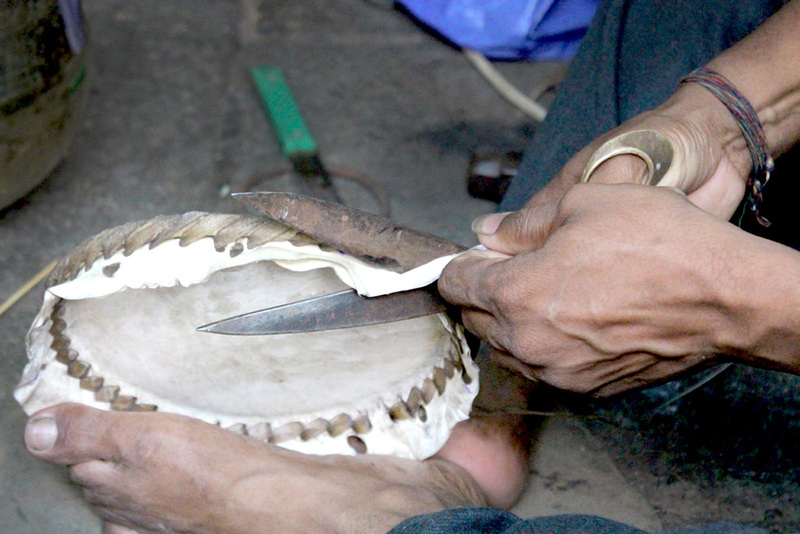 It is later cut into continuous strap material to assemble pudi to tabla and dagga. 1) The membranes. 2) Weaving. 3) The black spot. 1. The Membranes: The resonating membrane consists of two components. They are (i) Maidan and (ii) Chat. 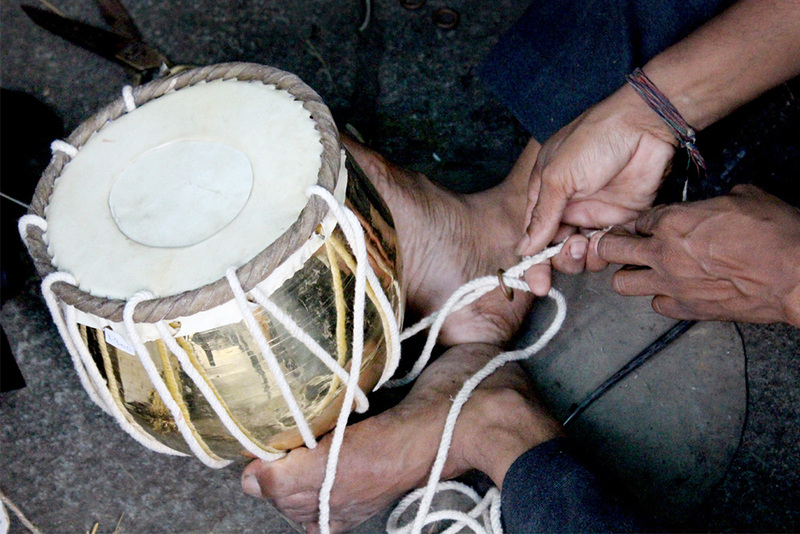 (i) Maidan is the only inner layer that covers the entire opening of the drums. It is an important part of pudi. (ii) Chat is the top most layer of the skin that covers the outer periphery of the sounding surface. This serves for dual purpose. It is an important part of the resonating membrane and on the other hand it gives mechanical strength for weaving. 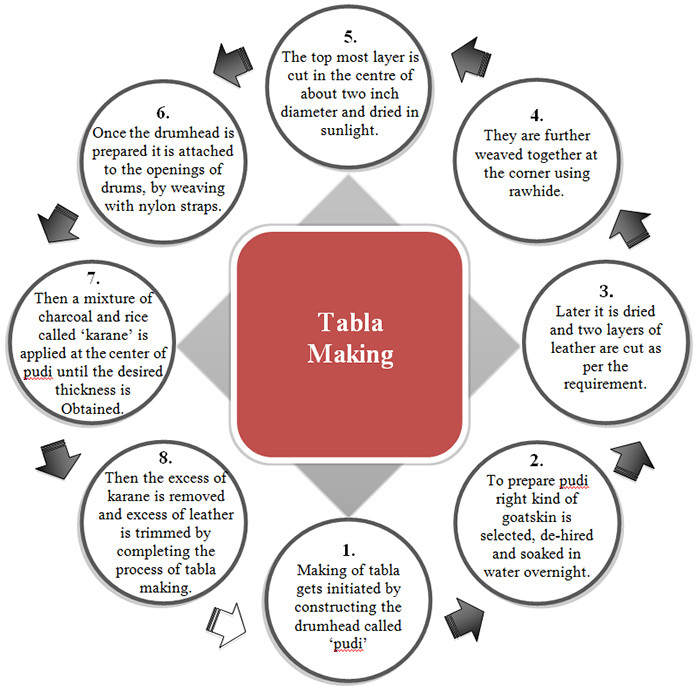 This has a great effect upon tonal quality of tabla. Thus the chat is laid on top of an intact skin (the main playing skin-maidan) and fixed to it. And at the centre of chat, a circle of two or three inches in diameter is cut and removed. The maidan and chat that are fixed to each other is then stretched over the mouths of the drum shells and tied securely. 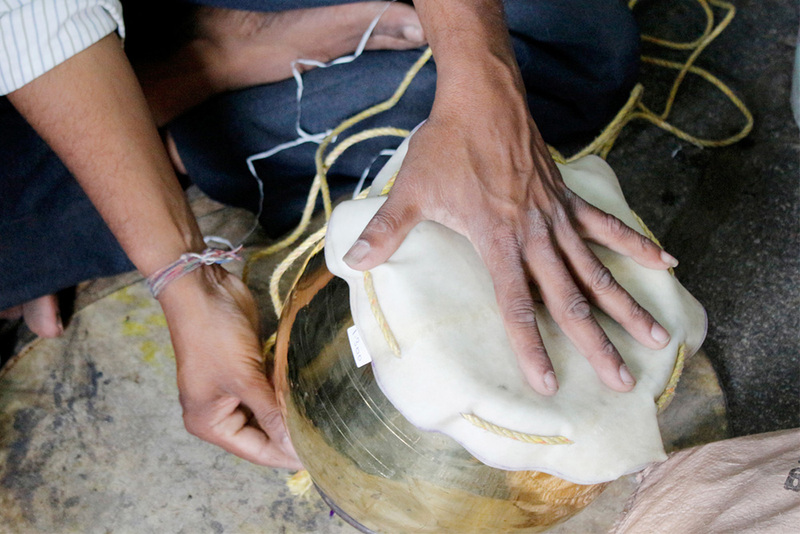 Though the attachment between chat, maidan with the drum shell is not stiff enough at this stage, during the weaving process ‘gajara’ the attachments between them gets stronger and sustains the stiffness. 2. Weaving: This part of weaving is called as ‘gajara’. 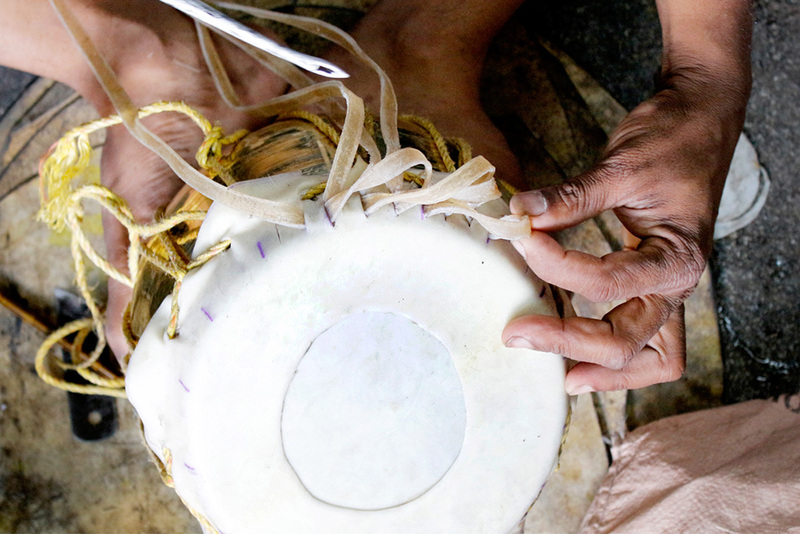 It is a heavy ring of woven leather or rawhide that is woven into pudi around its boundary. It functions as a tensioning hoop, which transfers the tension from lacing to the sounding skin by fitting over the top of the drum’s body. The invisible layer of skin that is inside the surface of pudi is called as ‘bharti’ that provides the mechanical strength for pudi. And the outer hemmed layer that is visible is called as ‘hindige’. 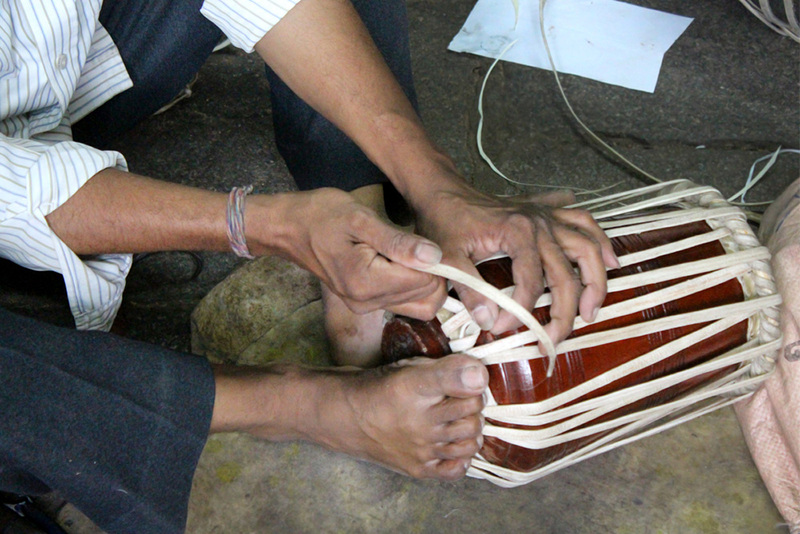 The weaving gets begin by making the vertical slits around the edge of tabla. In bayan sixty-four slits are made and in dayan forty-eight slits are created. Further weaving gets initiated actually by inserting lengthy leather straps into three adjacent slits to wrap the rim all around. Step by step the leather straps are weaved by inserting them in two slits and twist them in clockwise manner and pull out on third slit. By repeating the same procedure gajara is weaved until the last slit where the starting point of weaving had begun, there the weaving is stopped and all the leather straps and chat are pulled tightly and the steps are carried out for more times and the excess of leather is then chopped off to complete the weaving part. Thus the drumhead ‘pudi’ is prepared and kept for drying in sunlight for a day. Later it is mounted to the drum shell. 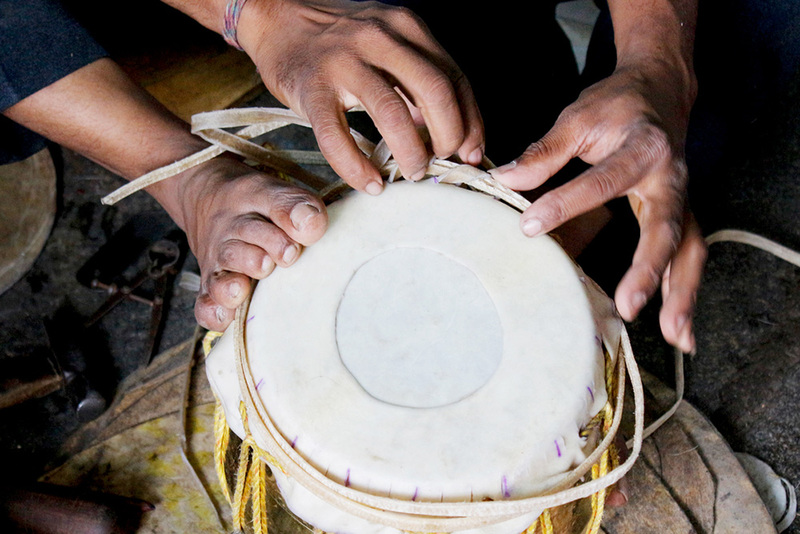 In dayan it is small wooden body of the drum that is mounted with drumhead whereas in bayan it is the big steel body that is mounted with drumhead. 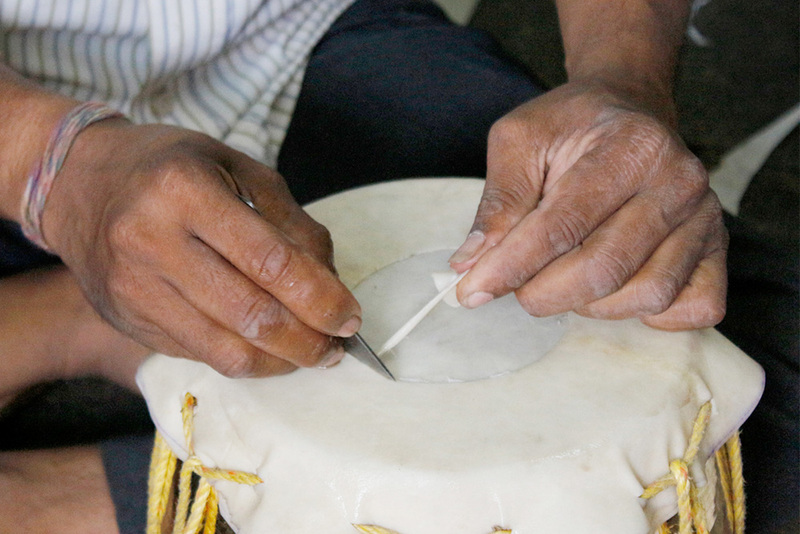 These drums bayan and dayan are fixed with their respective drumheads using nylon straps along with the handcrafted base of the drums attached and are wounded all around the drums firmly in a vertically manner. 3. The Black Spot: It is called as ‘karane’ or ‘syahi’ that is spotted at the centre of pudi. 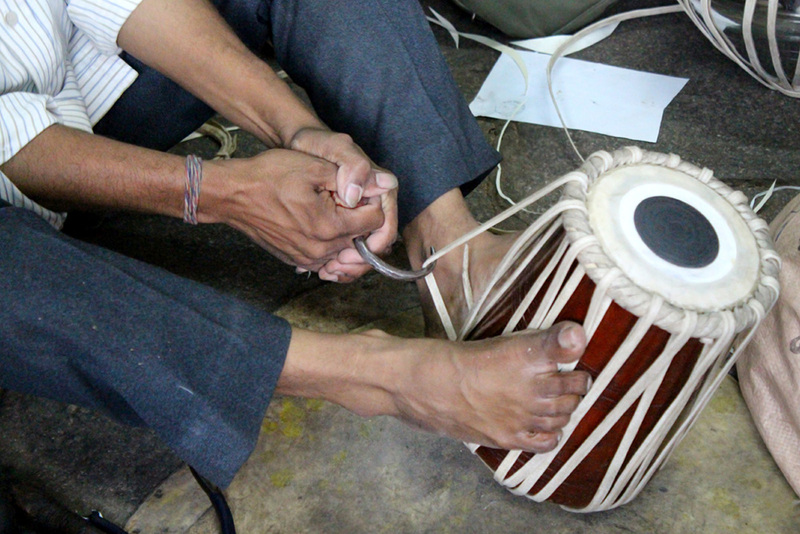 Probably it is the most distinctive part of the tabla. It is the most important component in determining the tonal color. The Syahi is prepared by adding cooked rice to charcoal powder and kneaded thoroughly to get the required consistency and rolled into a doughy ball. Further it is mixed with synthetic adhesive and applied on the exposed surface of the maidan. Using the forefinger of the right hand small quantity of the mixture is taken and applied quickly in a circular form, approximately 3 ½ inches for dayan and 4 or 4 ½ inches for bayan. The circle is allowed to dry in sun. 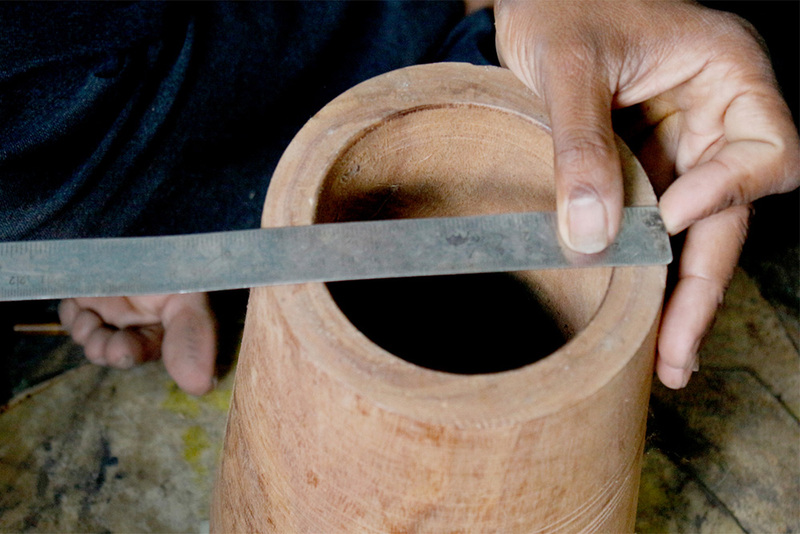 Once the syahi is dries, it is rubbed repeatedly by a polished piece of basalt. This polishing is very important, as it will help in determining the density of cracks that are visible in syahi. Thus repeatedly four or five layers of syahi is applied and once it’s dried it is rubbed thoroughly after every application. Then the diameter of the application is reduced until the layers are almost half an inch or until the desired thickness and shape is attained. One thing that is a must to keep in mind is that syahi will always be thick in the centre compared it at its edges. Usually the thicker syahi resonates lower frequency than the thin one. The other point of this syahi is, it is applied in numerous thin layers that covers up all the cracks and considerably covers the particular area of the skin. It is also obvious that the ingredients of syahi harden to the consistency of cement when dried. As the final construction of dayan and bayan, the excess of syahi is scrapped out with a blade. Chat is trimmed while maidan is protected from blade by bamboo piece carefully. Chalk powder is then applied on chat and maidan and sanded lightly with the sandpaper to make the instrument look neat and clean.